The plot finds Stu (Ed Helms), the straight-laced dentist, getting married to the beautiful daughter of a wealthy Thai businessman.The big event will take place at a gorgeous seaside resort on the Thai coast and all of Stu’s buddies are there for the shindig. An evening of shared manliness on the beach somehow turns into an all-night debauch, with Stu, the sardonic Phil (Bradley Cooper) and the infantile Alan (Zach Galifianakis) awakening in a seedy Bangkok hotel room. With them is Chow (Ken Jeong), the anarchistic, motormouthed gangster from the first film, a monkey wearing a denim Rolling Stones vest, empty liquor bottles, a gigantic roach and, most disturbingly, a human finger. Alan has lost his hair overnight. Stu now has an impressive tattoo…on his face. “I think it’s happened again,” Phil moans. A class ring identifies the digit as belonging to Teddy (Mason Lee), the bride’s 16-year-old brother who was part of the boys’ night out and now has vanished into Bangkok’s sexually-charged underworld. With no memory of the last 12 hours, Stu and the boys must somehow retrace their steps, find Teddy and get back to the resort in time for the ceremony. Director Todd Phillips and his fellow writers delight in upping the ante with every new revelation, the most eyebrow-raising involving a bar/brothel staffed by beautiful hermaphrodites. Films like “The Hangover Part II” aren’t remembered for the acting, but you’ve got to credit this cast for beginning with barely-suppressed hysteria and building to a crescendo of panic. The film’s single best performance, though, is given by the mugging, cigarette-smoking monkey, who exhibits a range of emotion the equal to any human. Isn’t it time for an Animal Oscars? Bob – happy to hear you’re up and running and reviewing movies still. 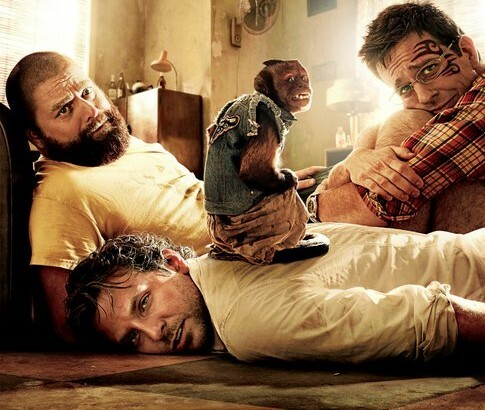 Your review of Hangover 2 was spot on – especially the part about Bridesmaids. That’s the first ever movie – where all the funny parts were in the trailer – but cut in the actual movie…must be to sell the unrated DVD? Anyway – I have started my own company called SpiegelCreative. Just an fyi – I am in production of a new feature-length documentary – GroundBreaking. It’s my first since CityBall. It is about the past, present and future of sports architecture – and how an industry was born right here in Kansas City. I’ve been following many of the big name firms around (Populous, 360, etc) – been to both coasts, followed the making of Livestrong and sent a camera to Iraq. I don’t have any trailers yet – hoping to wrap things up with the opening of the new soccer stadium. But with all the firms, the history, the Sprint Center story, global expansion and the Kansas City connection – you might be interested…I will keep you up to date. Anyway – just wanted to wish you well – and would love a Robert Butler review of GroundBreaking one of these days – when it’s made and released!